Less time worrying about your guitar means more time focusing on what’s important—the music! There are a lot of chemicals used on guitars, and there are safety issues with which to be concerned—for the guitar and the person using it. A talk box that predates 'Frampton Comes Alive' by more than 35 years. Cantrell not only details his guitars, pickups, pedalboard and amplifiers, he often tells viewers how and why he started using them. A quick read that might ultimately save you a few bucks, or prevent an embarrassing mid-performance string break. Learn about matching hardware by painting and heat treating. A compressor pedal can be one of the most valuable tools you can have in your setup. A rather unconventional option for a pickguard replacement on a vintage guitar. The history of a strange fretless slide guitar... thing. Four handy hacks that make working with guitar pedals easier. A rare, up-close look at Kurt Cobain's 'In Utero'-Era Fenders. Some of the strangest axes you'll ever see. 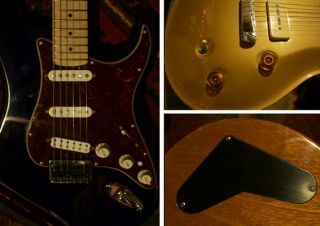 Five things about Seymour Duncan and its products that you may not know. Anyone with the most basic soldering and woodworking skills can build one of these. Five of Ibanez' most oddball creations. No, David Gilmour is NOT auctioning off the first ever Strat. This great-playing lap steel only takes an hour to make. Get up-close and personal with Stevie Ray Vaughan's “Number One” Strat. An Eisenhower era treasure that you can build yourself. Steve Vai shares some of his private guitar stock with Guitar World.